If you ask anyone in Curaçao what you cannot miss at a wedding or communion, they will all give you the same answer: Bolo Pretu. The Bolo Pretu is often used to celebrate important life events. 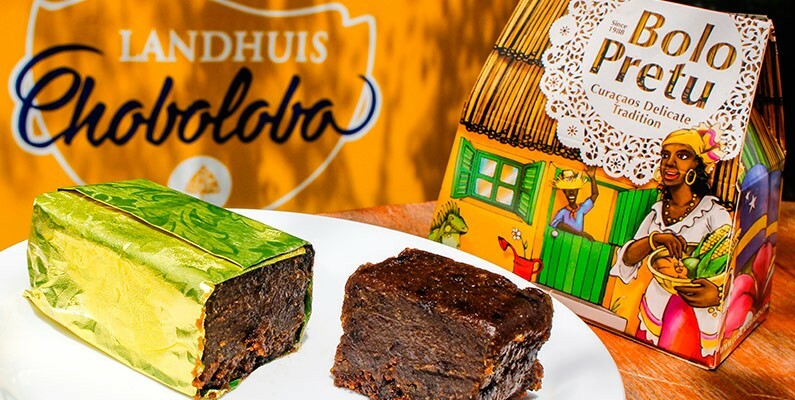 It's not a treat you can buy whenever you want to indulge in it, but the company Curaçao Delights has made it its mission to take care of those Bolo Pretu cravings. This traditional cake is quite expensive to make because of the ingredients and the long process. Many people don’t know this, so Curaçao Delights helped us get an insight into the types of ingredients used and the work it takes to make it. The exact recipe they use is a trade secret, but you can always find some recipes online and give it a try. Bolo Pretu literally means black cake. It is an alcoholic fruitcake made out of a variety of fruits, such as dates, raisins, cherries, plums, and pineapple. The first step is to get the right amount of each type of fruit by weighing them. After you have the right amount of each fruit, the next step would be to grind the fruits and turning them into a black and sticky paste. This fruit mixture has to be covered up until it’s ready for the next ingredients. This next step is crucial for making the Bolo Pretu sweet and delicious: the syrup mixture. Add brown sugar, dark corn syrup and a little bit of water in a saucepan. Let it cook over medium heat until it starts to rise. When it starts to rise you should remove it from the heat and pour it over the fruit mixture. At this point, you can also add jams, such as pineapple to the fruit mixture to give it a bit more taste. Mix the fruit, syrup, and jams and let it cool completely. After it cooled completely, add a large amount of the different alcohol such as cherry brandy, cherry cordial, rum, spiced wine, and, of course, the Curaçao liqueur (which has an orange flavor). The Senior Genuine Curaçao Liqueur has the perfect alcohol characteristics for a Bolo Pretu. It has a sweet taste and has a higher alcohol percentage than most other orange liqueurs. This fruit, syrup and alcohol mixture has to sit for about a week. The mixture will not spoil because of the amount of alcohol that is poured into it. In fact, it will taste even better! After a week, the preparations start again. This time, you have to make a normal cake mixture, using butter, brown sugar, flour, vanilla and almond essence. Pour the white cake batter into the fruit mixture and blend it until they become one. Now it is time to prepare the baking sheet, by lining it with foil and spraying nonstick spray on the foil. Pour the batter into the baking pan and bake it for two hours. When the cake is done baking and it has cooled completely, sprinkle a bit of Senior Genuine Curaçao Liqueur over it to give it more flavor. For more information, check Curacao Delights.